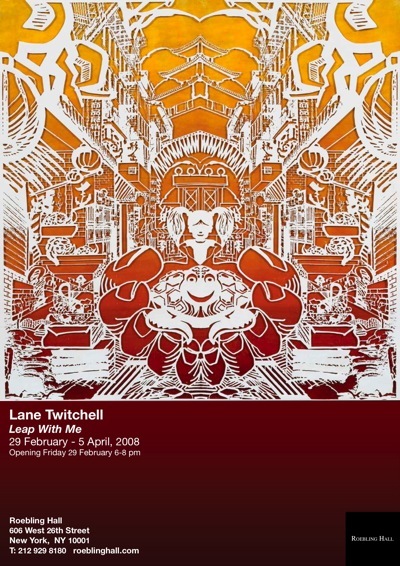 In the Project Room, Roebling Hall is pleased to present “Leap With Me,” an exhibition of new work by the Brooklyn-based artist Lane Twitchell. The exhibition marks the return of this artist to the gallery, having first exhibited with us in 1998.The basis of Mr. Twitchell’s work is folded and cut paper and occasionally spun Olifin, also known as Tyvek. Originally selected to reproduce the repetitive nature of the modern suburb, the artist has developed this form to meet his ends with some unexpected results. The disarmingly decorative nature of the work can seem simple-minded at first; however, the seductive nature of decorative strategies becomes part the content the artist is exploring. Mr. Twitchell is interested in the mythologies of the United States as “Promised Land,” with its tropes of strong masculine explorers paving the way for (and protecting) delicate feminine domesticity and innocent childhood. Mr. Twitchell is also investigating the paralyzing awe romanticized by 19th century Americans looking west to “their” virgin continent. Twitchell’s work is often inspired by these elements of American culture whose roots run to the deeply religious, and deeply conflicted, foundations of the nation. This exhibition marks Mr. Twitchell’s first extended engagement with an outside fabricator. The artist spent the summer working in a garage in Palo Alto California. The drawings he produced there have been translated into cut paper and polyester film via an industrial laser cutter. So sorry I’m missing the opening, but will make it before April 5. Go Lane! So about the turtle that little girl is holding out. Would that be Sam or Ella? congrats on the new show, lane! Goodness, I wish I could see this picture, and the rest, in full scale. The work looks quite compelling. Have a good show. As to Jeremy’s comment: his deepest and most interesting ambivalence is in regards to turtles. Huh? What? Turtles? I like turtles. And orange and yellow and that deep maroon. wow Jeremy has an ambivalence to turtles . . . So anyway, thanks everyone, the night was a smash, as expected. now that is sooooooo impressive. i love the intricacies. you should feel proud. detail upon detail. i am your newest fan and sorry to sit restless on another coast. when will you show in los angeles? Turtles are one of the four enchanted animals in Chinese mythology. This, however, is mere coincidence. oh, i hope they are happier there than they were in our little aquarium. lane, sorry that we missed your show! looks beautiful what we can see of it. ah yes, Sam and Ella, I was thinking more of Kurt and Courtney, all those years ago. That’s not true really, this turtle bears no resemblance to any turtle living or dead. of course, *we* know lane only *looks* clean cut.